He was right of course. I was crying about a terror attack on Israelis that occurred before I was born because I had seen it so many other times – both the horror and the beauty. At the time, the horror of the terrorist attack on the Israeli athletes stunned the world. Now it is almost taken for granted, as if the slaughter of innocent Israelis is only to be expected. What was overlooked then, as it is now, is the sublime grace of Israelis under attack. In Munich it was Moshe Weinberg who, sensing the danger, threw himself up against the door, screaming at his friends to escape before the terrorists could enter. Gad Zavarj survived because Moshe blocked the terrorists, giving him enough time to jump out of the window. Joseph Gutfreund did the same, blocking the door so his roommates could escape. It was not about their own safety that they were thinking; it was about their friends. Last week it was Ofer Ben Ari who put himself between terrorists and a fellow Israeli they were stabbing. Driving in Jerusalem, Ofer witnessed the attack in progress, flung himself out of his car and battled the terrorists barehanded. The person he wanted to save wasn’t someone he knew. He wasn’t a friend but he was family – a fellow Israeli, under attack simply because he was an Israeli. Without making any special effort I can tell you of six more people who have consciously placed themselves between terrorists and others, sometimes friends, sometimes strangers, knowing full well that they would probably not survive. If I think about it I can tell you of many more incidents (I have written about a number of them). I’m sure that most people around the world can comprehend battling a murderer to protect a loved one. How many can picture themselves shielding a stranger, taking the danger on themselves in hopes that the stranger would survive? That is Israel’s Secret Sauce. Israel confuses many people (sometimes we confuse ourselves). We argue and fight constantly about pretty much everything. How to run the country, what it means to be Jewish and what the future of our Nation will be are common disagreements. 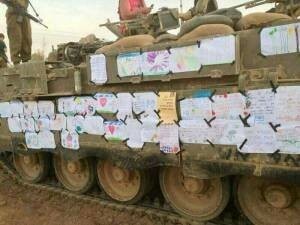 Tank plastered in blessings from children. Wrapped in love: July 2014, IDF soldiers plaster their tank with letters of encouragement from Israeli children. There is one thing that Israelis universally recognize and define as “that is Israel”: Israel’s Secret Sauce. It’s what led the entire country to come to a standstill when Gilad Shalit was returned home. The Nation (no matter what disagreements there were about how to get him back) held her breath to see one Son of Israel back where he belonged. It’s what led the State of Israel to count and search for every single Israeli in Nepal during the devastating earthquake this past April. After 1,999 people had been found, it became clear that something had happened to Or Asraf. The Israeli embassy sent help: search and rescue experts as well as medical personnel to set up a field hospital for anyone needing assistance. When Or wasn’t found his friends from the army set up their own search and rescue mission, flying to Nepal to bring him home. They did not rest until Or was found and returned to Israel for burial. “No man left behind” is not a slogan. Israel’s Secret Sauce is what magnetizes Israelis abroad to automatically find each other and build their own little community. The people might be argumentative, annoying, with vastly different worldviews but when it really matters they will be there for you. Family. We have something no other nation on earth has. Israel is and has many things: history, faith, culture etc. but there is one thing that ties it all together: the Secret Sauce. Can you say without a shadow of a doubt that your neighbors would die to protect you? I can. Can you say without a shadow of a doubt that your country would swoop in to rescue you if you were trapped someplace half way around the world? I can. Israel’s Secret Sauce is Love. And what our enemies don’t understand is that the harder they try to destroy us, the stronger we become.